I recently received (from Amazon) an utterly fantastic book, Kimono as Art: The Landscapes of Itchiku Kubota.Â If you are a dyer, or a textile artist of any form, do not walk, RUN to Amazon and pick up a copy.Â It is inspirational. 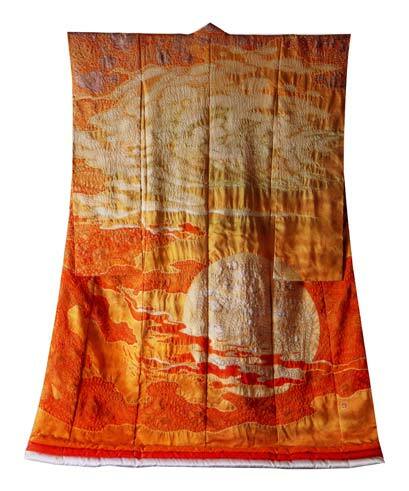 Itchiku Kubota was a Japanese artist who used brush painting and various forms of resist dyeing on silk to create fabulously beautiful kimono.Â (This is roughly like saying Van Gogh was a guy who used a brush with oil paints on canvas. )Â I first became aware of his work when I was visiting a friend and happened to glance through a copy of Smithsonian, the Smithsonian Institute’s magazine.Â In it was an article about Kubota, and photos of the most beautiful textile creation I had ever seen.Â I took one look and said, “I have seen the face of God”. Possibly a little over-dramatic, but I mean it: in that kimono, I saw the face of my Muse, and the kind of work I would spend the rest of my life striving to create.Â Kubota’s work, at first glance, is a gloriously beautiful dyed piece.Â But as you move closer up, you can see the incredible detail of his work: tiny shibori stitches, delicately brush-painted flowers, flowing shades of dye.Â What I love about his work is that it is complex and detailed- you gain more by seeing it closer and closer, and one piece has enough to keep you occupied for a long time. 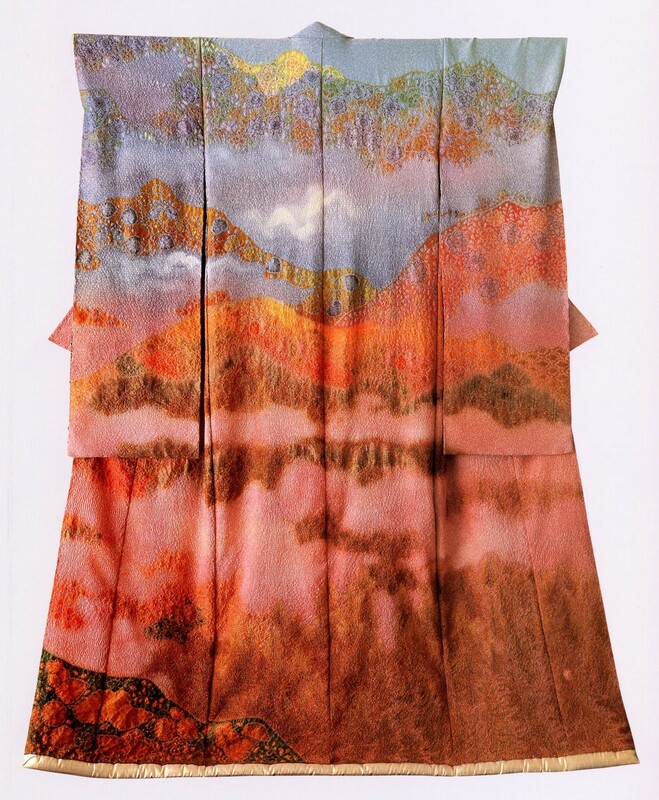 Kubota’s work also represents dedication.Â He spent nearly fifteen years researching and experimenting with dyes before producing his first kimono.Â He started his atelier at age 44, but it wasn’t until he was 60 that he had his first show, with a relatively simple version of the kimono you see above.Â He studied many different arts to produce his work.Â It is that singleminded dedication, that commitment to follow the Muse, that I strive for in my work.Â I will probably never achieve his mastery, but on my deathbed, I’ll still be trying. Kubota spent more than twenty years attempting to perfect his version of tsujigahana, and during that time he did not show his work publicly.Â In 1980, he said, “Those years were a succession of experiments in dyeing, of failures and disappointments, with a new method conceived from the very next day and a new start made from scratch.”Â This perseverance when confronted with repeated failure was one of Kubota’s strengths; it was reinforced by the fact that he learned his meticulous and time-consuming craft in the Japanese apprenticeship system.Â As an apprentice, he would have developed patience while kinesthetically absorbing technique; neither the idea of efficiency nor the concept of “short cuts” exists in the world of traditional Japanese crafts. My observation of Japanese crafts, such as origami and Japanese knitting, is that they have a level of intricacy and detail that is seldom found in American craft.Â I’m not saying that it’s universally true: the origami work of Robert Lang and John Montroll is precise and beautiful, and there are certainly American knitters who do intricate knitting, tapestry weavers that work in fine detail.Â But as a whole, American craft strikes me as larger-scale, lacking the detail and delicacy that I see in Asian art.Â It has its strengths in other areas, but it is Asian art that most inspires me.Â Kubota expresses the Muse with incredible power and delicacy, and it is his spirit and dedication that I aspire to in my work. Oh. My. and – yes – that level of astonishment and resultant aspiration comes through in your work. When I was a quilter I read about the Japanese schools for learning quilting. To go through the entire program took years. I mourned at the time that there was nothing like that in the U.S. And to this day I firmly hold that in order to create art, one must first be a consummate craftsman. I went to an exhibit of Kubota’s work arranged around a room to form a continuous landscape in which the season gradually changed from winter to spring to summer to fall and then winter. The effect was completely overwhelming. The rhythm of the garments with spread-out sleeves gave the feeling of looking through open windows or perhaps more like standing on a large porch looking out at scenery of incredible beauty. I just had to return to the exhibit, bringing a friend and telling all my fiber friends. It was at the Smithsonian, in the Natural History museum of all places, and I have a poster and book from that exhibit. It blew me away. It was years ago but not to be forgotten. Standing near a kimono there were stunningly beautiful details in the dye work, while the long view was ethereal.